What can we observe with SHG ? Is 0656 the return of 0649 ? The BSO (Belgian Solar Observers) (Werkgroep Zon of VVS) organized a meeting near Brussels on October 27th, 2007. The coordinator, Franky Dubois, proposed one day of communications about diverse works and solar observations. 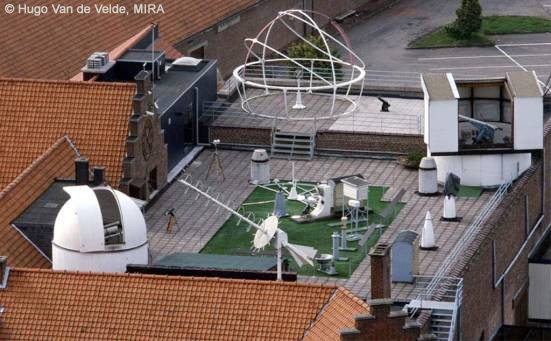 It is the Mira observatory, at Grimbergen, which welcomed this congress. June 24th and 25th, 2006 took place the days of the Sun, organized by the GFOES (French Grouping for the Observation and the Study of the Sun). Program: oral presentations and observations (possible on 24th) in white light, in Ha and in radio. Nice and studious atmosphere. The slideshow that I had the pleasure to present at Nieuwpoort, in Belgium, October 15th, 2005 is on-line. To view it, you just have to download it (48Mo) and to unzip the file. You must have Powerpoint 2003 (or later version) or Powerpoint viewer and possibly to install the suited video codecs (install all the codecs). These days of meeting were for me the occasion to discover a dynamic association, including many young amateurs motivated by all the aspects of the astronomy. I also spent pleasant moments along the Flemish coast under a radiant Sun and an exceptional sweetness for this period of the year. The slideshow that I had the pleasure to present on November 13th, 2004 is on-line. You just have to download it (38Mo) and to unzip the archive. You must have Powerpoint 2002 (or later version) or Powerview to play it. I send all my congratulations to the organizers of this meeting and many thanks to those who allowed me to participate.